Caption slip reads: "Photographer: Gaze. Date: 1957-06-29. Reporter: Gaze. Assignment: MR. Muscle Beach Advance. #3-29-30: A pretty girl and a dumbell help Chuck Collras, 25, as he works out in preparation for 11th annual 'Mr. 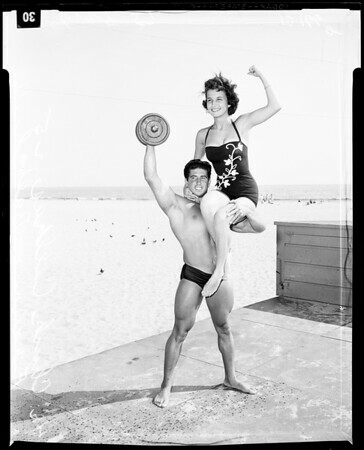 Muscle Beach' contest to be held at Santa Monica July $. The girl is Francine Balogh, 16, a Washington High School student, of Los Angeles. Collras is a machinist with body building as his hobby."